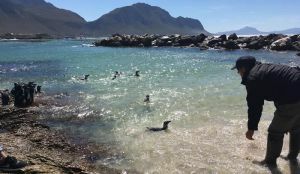 For the crowd that gathered at Betty’s Bay last Saturday for the Penguin Palooza with CapeNature, the highlight of the day was the release of 21 rehabilitated African Penguins back into the wild at Stony Point. Among those released were two miracle survivors. One had been found with its beak jammed into a plastic ring. Unable to close his beak, he had developed infected wounds at the corners of his mouth, that were down to the bone. 11 weeks in SANCCOB’s care led to his complete recovery and another chance to live in the wild. 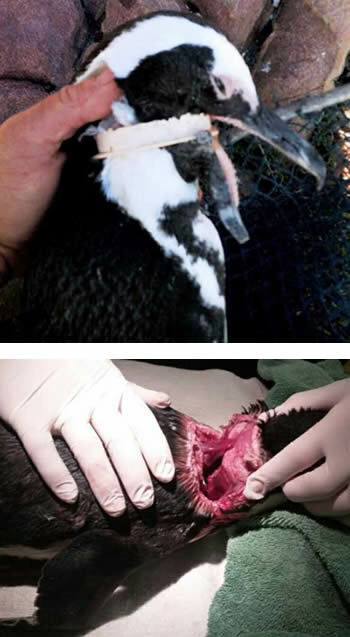 A deep laceration and a severed neck muscle couldn’t kill this penguin’s fighting spirit. Rescued from Boulders, 13 hours after a two hour surgical procedure to re-attach its head, this little one was standing up straight and looking around. After only 6 weeks in our care, the penguin was 100% healed and waterproof. What a champ! Sadly these two cases highlight the hazards that endangered African penguins and marine life in general face each day. Thank you to all who support our cause and enable us to continue to save seabirds, together.